What a neat looking, versatile fry pan! This Mert 3 Qt Stainless Steel Fry Pan with Lid is a great fry pan with many desirable features that can adapt to various cooking methods and create delicious dishes for your family and friends. 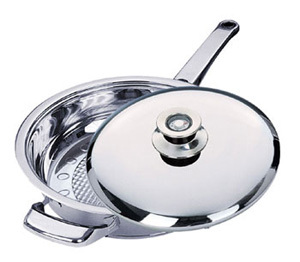 This fry pan set is suitable for electric, gas, ceramic and halogen ranges. High grade 18/10 CrNi stainless steel for heavy duty performance capabilities. Thermomeer lid should be hand washed. Megatherm encapsulated sandwich of stainless and aluminum in pan bottom Transfers heat quickly and evenly through the fry pan. Optimal heat conduction Saves on energy consumption. Raised design in pan bottom Aids in low fat and low water cooking. Lid has a thermometer knob Helps control heating and produces desirable cooking results. Mirror polished exterior and mat finish interior Enhances this sleek looking fry pan that will look great in any kitchen decor. Handle Is high quality plastic and heat resistant.